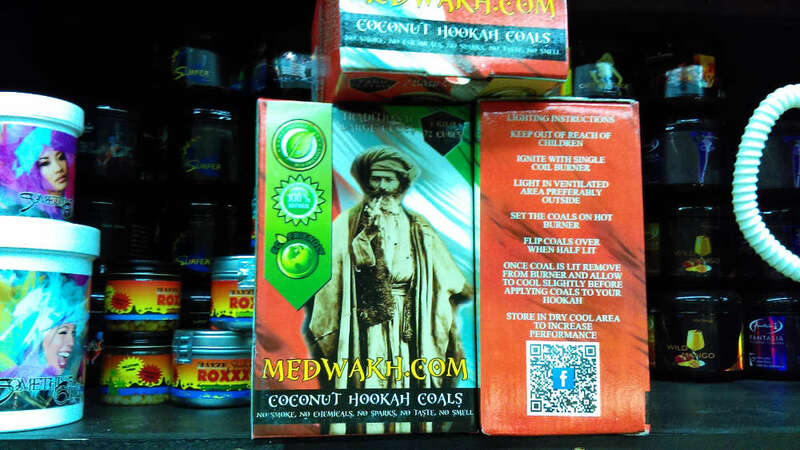 Medwakh is an established company out of Lawrence, KS in the dokha tobacco realm and we offer their high quality coconut charcoals as well. These 100% organic coals are made from coconut shell husks, they can burn for up to two hours and they do not spark or give off odor when igniting. This dense cube coal uses all natural ingredients and contains no sulfur so there is no change in the taste of your hookah. Just like any quality coal, you’ll need a bit of effort to get these things performing well. You will need some kind of burner to ignite whether it be via torch or table top burner, but once you do … relax and enjoy your favorite shisha flavor. The Medwakh charcoal box we offer contains 72 cubes of charcoal and weighs 1 kilogram.